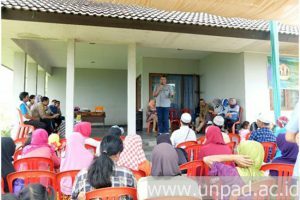 [unpad.ac.id, 18/12/2017] A number of doctors from Universitas Padjadjaran Faculty of Medicine and Faculty of Veterinary Medicine performed Community Service (PKM) in Cimalaka District, Kabupaten Sumedang, on which the main event was held in last November 2017. This PKM was an application of university Tridarma as well as a manifestation of sense of caring to improve life and prosperity quality of dairy goat breeder groups in the area. PKM titled “Profil Kesehatan Peternakan dan Kambing Perah Pada Kelompok Peternak di Simpay Tampomas, Cimalaka, Kab.Sumedang” was a series of activities conducted in several visits. On the first visit, a demographic condition survey was conducted as well as sampling from dairy goats. The field result showed a number of dairy goats having common diseases such as diarrhea and scabies. A few weeks later, the second visit was made to conduct a health test for 30 farmers consisting of checking nutrition status, blood sugar levels, and blood profile. On the main event held Saturday (4/11), PKM team conducted health education of farmers and general explanation about the result of health test that the resident had got. In front of the resident, speakers emphasized about the explanation of good-farming practice to increase livestock potential in the area and prevent the loss due to the declining health of dairy goats. The resident included farmers who came to visit looked enthusiastic during the series of the event. The counseling was quite interactive because it involved resident to participate actively for answering some questions from presenters. As a token of appreciation, the next event was a symbolic handover of souvenir Prof. drh. Hj. Roostita L. Balia, M.App.Sc., Ph.D. and Prof. dr. Ramdan Panigoro, M.Sc., Ph.D. In this session, the event felt increasingly vibrant. It was seen from the enthusiasm of resident, both parents and children, while waiting for the distribution of school bags for children there. Not to forget after this activity, the resident and PKM team took a picture together. On that occasion, there was also an individual healthcare consultation session with the doctors. The residents were allowed to ask about various health problems especially related to the result of health test that they had got.